NOTE: Due to the outstanding interest in this piece we have added additional information. The lock itself is hefty which is unusual as many of the early hair examples of hair of famous persons (not necessarily Washington), have been broken down and sold a few strands or even a single strand at a time. Generally, we have stayed away from "hair" because of the lack of strands and insufficient authenticity. This piece is the exception. Originally this piece was purchased in a Superior Auction Gallery sale in 1992 which emanates from an important historical autograph collection. The piece carries the original paper label from the sale. We actually had heard of this sale as at one time when we were consigned several pieces from this same sale consigned by a major coin dealer. We were told by a major autograph dealer that this Superior sale was famed for having "fallen through the cracks". And was noteworthy as many major people had missed it as it was sold by a coin auctioneer versus a major autograph venue. 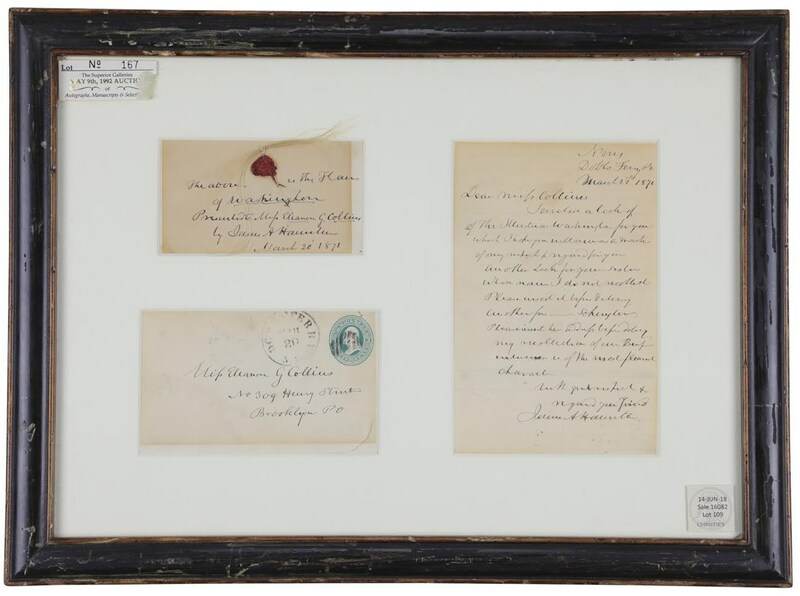 This is an important American artifact and Lelands will provide our letter of authenticity that will guarantee the piece to be authentic as long as it is in your possession. Important historical artifact joins these two inexorably linked Founding Fathers. Lock of hair of the Father of our Country General George Washington, emanates from the family of Alexander Hamilton. 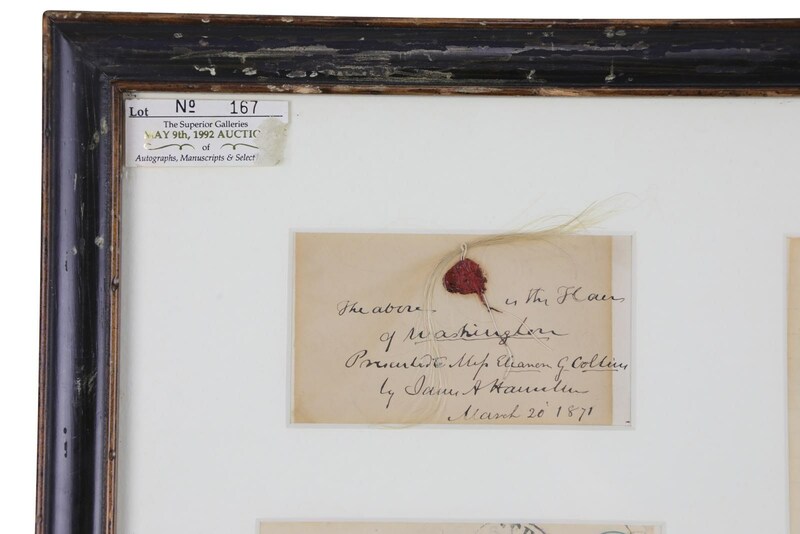 Hefty lock was affixed for a century and a half to an autograph note signed by James A. Hamilton, former Secretary of State and third son of "Hamilton" who sat at his father's bedside as he infamously laid dying from Aaron Burr's bullet. Note (4.33" x 2.36") presents the lock to Eleanor G. Collins on March 1871. The strands measure approximately 5.31" in length, are gathered together with string and affixed to the card with sealing wax at top center and is vintage matted and framed. 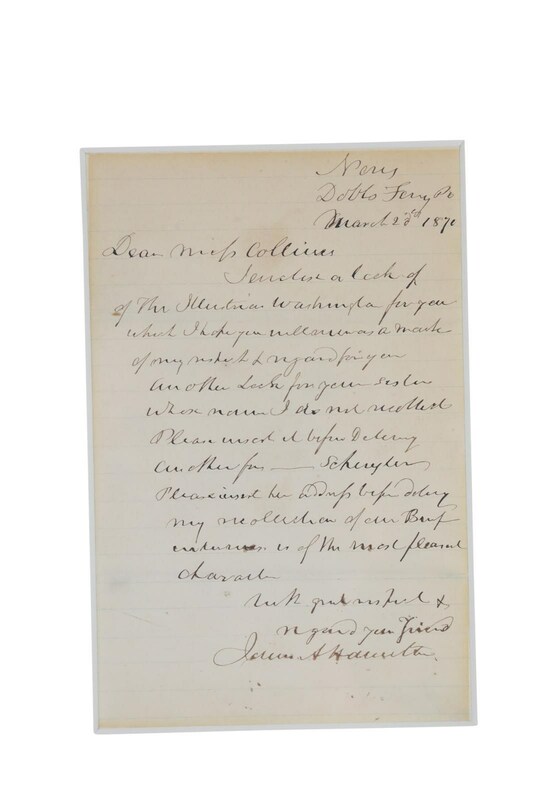 Comes with autograph letter signed “James A. Hamilton” to Ms. Collins, Nevis, Dobbs Ferry, 20 March 1870 enclosing the aforementioned “lock of the Illustrious Washington […] as a mark of my respect and regard for you.” As we know George Washington and Alexander Hamilton were close. Washington was the patron of Hamilton, and Hamilton served in Washington's cabinet as his Secretary of the Treasury, where he birthed our modern financial system. Hamilton advised Washington on various matters, particularly financial, and also wrote speeches for Washington, and even helped Washington to quell a rebellion. The modern relevance of this piece is inestimable with the world famous theatrical production of the play "Hamilton" by Lin-Manuel Miranda. AH's standing in our culture has been raised to a whole another level bringing this major historical relic along with it. As far as this sale goes Lin-Manuel Miranda said it best, "It's time to take a shot. And I am not throwing away my shot."